Immersive analytics environment from Accenture Analytics transforms relationships with data. Accenture (NYSE: ACN) is launching the Accenture Connected Analytics Experience, an immersive and collaborative analytics capability that makes data more accessible and engaging, helping insight-driven businesses make faster, more informed decisions. The Experience is designed to make analytics easier to understand and expand the range of business users who can undertake an integrated analytics journey – from C-suite to functional managers to data scientists. By transforming their relationships with data, users with a variety of skillsets can collaborate on a specific challenge in an analytics environment; more easily examine and interpret the insights via data visualizations, and innovate through data-driven exploration and decision making. Through an immersive environment, users can find the hidden value in their data, either live or remotely on their preferred devices, and pursue outcomes in real-time. 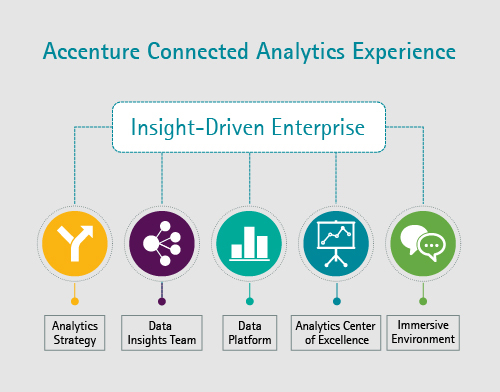 The Accenture Connected Analytics Experience, delivered by Accenture Analytics, provides users with next-generation business intelligence powered by end-to-end analytics offerings including analytics strategy, a multidisciplinary data insights team, a data platform containing big data technologies and an analytics center of excellence that democratizes analytics. Companies in the telecommunications, healthcare, consumer packaged goods, and financial services industries are already participating in the Accenture Connected Analytics Experience. The Accenture Connected Analytics Experience is a powerful example of a solution that was developed in conjunction with the Accenture Technology Labs, Accenture’s global R&D organization, which is focused on leveraging cutting edge technologies and applying them in new ways to address specific business challenges. Accenture maintains relationships with an ecosystem of advanced analytics providers and emerging players in the analytics and big data space. Mezzanine from Oblong Industries, enables the immersive environment for the Accenture Connected Analytics Experience. The Accenture Connected Analytics Experience is currently available in Accenture locations in New York City, San Jose, CA, and Bangalore, India. Accenture plans to build environments in other locations around the world including Chicago, Paris, Madrid, Milan, London, Mumbai, Singapore, and more. Immersive environments can also be built on premise at a company’s site.